First of all, Single-Nucleotide Polymorphism is appreviated SNP. Secondly, as the name suggests, an SNP denotes a change involving a single nucleotide. Such changes may be significant or not depending on a couple of factors. SNPs may occur within a gene or not and even if they fall in coding regions, the change could be synonymous (not affecting protein sequence) or nonsynonymous (changes protein sequence). DNA sequences are a paired chain of nucleotides (Adenine, Guanine, Cytosine, Thymine). The structure of DNA was discovered by James Watson and Francis Crick. 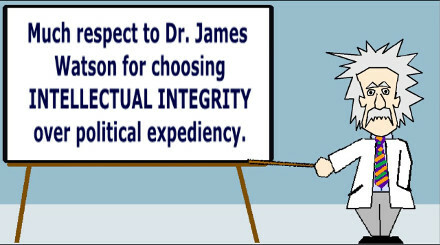 Recently James Watson has been criticized for making statements which don't adhere to politically correct ideology. Apparently, it is now the case that intellectual integrity threatens those who would have us believe in myths. It's almost like the Middle Ages all over again!